A simple change in Focus can change everything! "Why don't you let me take one of those?, I asked. I had my purse and a small camera bag. "I've got it," he replied. He was weary from lack of sleep and the long plane rides. Without an elevator the task was to get the heavy, oversized pieces of luggage down the three flights of stairs. Watching how he dragged the largest piece down the first three steps I decided he needed my help. Without asking permission I grabbed the luggage and began to show him a better way. He let go and stopped doing his part to get the luggage to the car. I expected him to keep holding his end but I did not communicate that to him. It was still snowing. I watched as he proceeded to get in on the passenger side. I was confused. Couldn't he see all I wanted to do was the help make things easier for him? It never occurred to me he might want to make things easier for me. He was so glad I got a motel room rather than driving the fifty miles home in the snow at 1:00 am. He knew driving through a blizzard the day before to pick him up after midnight was not easy for me. The multiple eye surgeries on my retina make driving under low light conditions or in the dark challenging. He did not need my help. He could have figured out a better way to get down the stairs. Or it could have been a bumpy ride. What difference did it make? 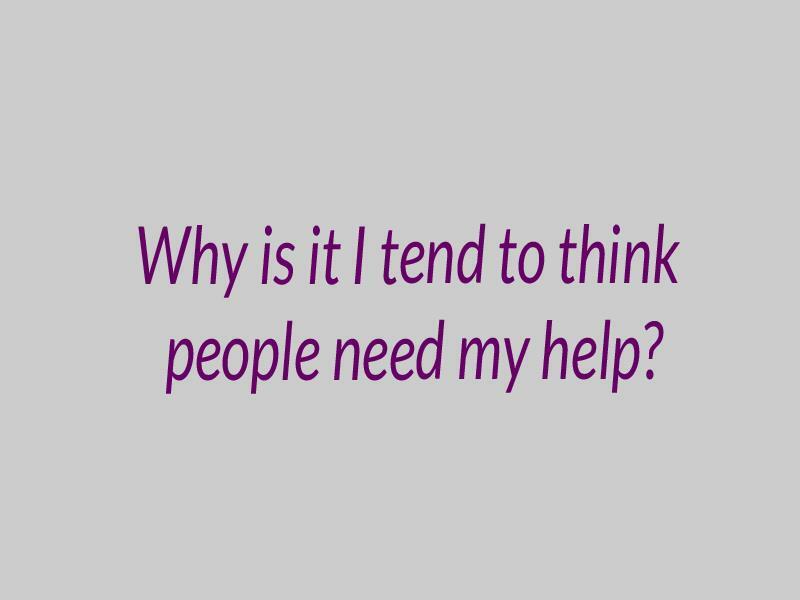 Why is it I tend to think people need my help? He needed the freedom to do it his way. And, he needed me to accept his way of showing his appreciation to me. Not honoring his wishes turned a pleasant morning into one of inner turmoil for both of us. For months I have been consciously changing old habits that no longer serve me. One is not allowing others to do something for me. Another is jumping in to help others when they do not need my help and did not ask for it. And, trying to get people to do things the way I would do it. Fortunately I now know by the way I feel when I am slipping back into an old habit. I am grateful for the experience and for the reminder to let go and allow. My emotions are such a blessing. They help me know if I am in or out of alignment with my spirit. When I pay attention to them I can practice getting back on track. Are your life experiences showing you where you are out of balance?